comments are in the chat room. 4/5/2019 2:15:34 PM MT Al****:: could be. But finally hit 2897 price, which is that white vibration level. 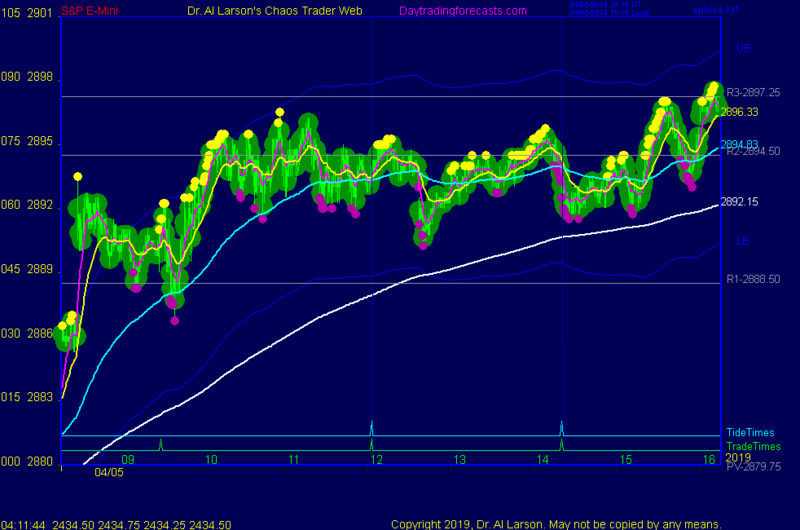 4/5/2019 1:59:58 PM MT ff:: Lots of Dojis on 60 min charts. Final push up next Monday and then pullback? 4/5/2019 1:32:51 PM MT ff:: Going for 9/21/18 high? Sure looks that way. 4/5/2019 12:42:36 PM MT Al****:: Thank you. Have a good weekend all. 4/5/2019 12:31:20 PM MT Ahab****:: Very good trade. Good job! 4/5/2019 12:08:12 PM MT Ahab****:: Reluctantly going your way Al. 4/5/2019 8:28:52 AM MT Ahab****:: Calculation doesnt change but variables change . 4/5/2019 8:28:17 AM MT Ahab****:: I thought I had come up with the calculation that resulted in 2897 but that calculation changes as the day progresses. 4/5/2019 7:43:13 AM MT Ahab****:: Al, I assume that , the cover price goes up a bit as we progress through the day. 4/5/2019 6:59:13 AM MT Al****:: I will point out a trade setup that often works for the Employment report. I pointed it out in the chat room yesterday. Late in the day one of my regulars logged in as ff pointed out that the late rally was being moved by a Green Swan, and prices were likely to run up into the close. I pointed out that this is often a "leaning up" into the Employment Situation report. I then pointed out that a target for a trade would be the white vibration level at 2897 on the Secret->esNat360 chart. That trade is developing now. I was aided in recognizing this trade setup by ff's comment in the chat room. I had been gone all morning taking my wife to a doctor's appointment. My mind was not on trading, but ff's comment refocused me. 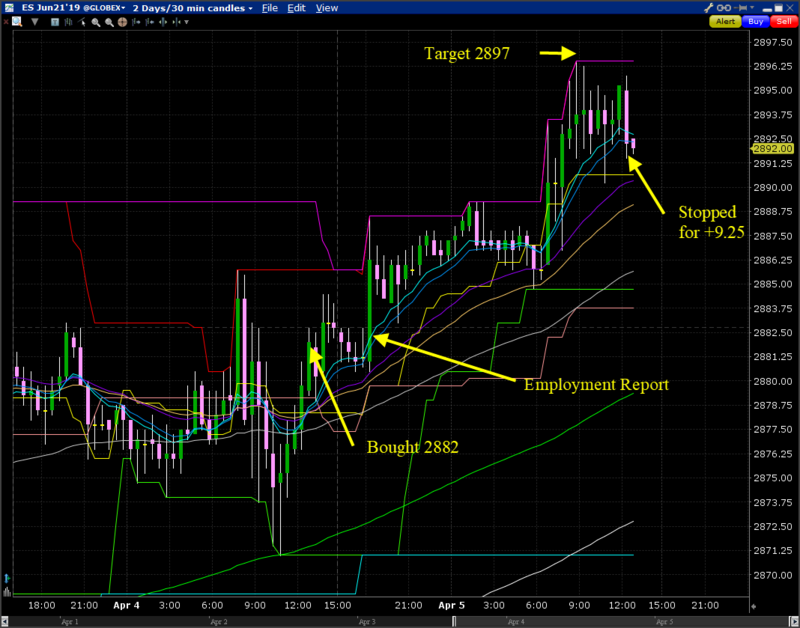 I did buy 2882, held overnight, and now have my stop at 2985.5 , cover 2897. This points out the value of "cooperate and graduate" when traders share what they see in the chat room. Good luck today, and have a good weekend. And Thank You ff!